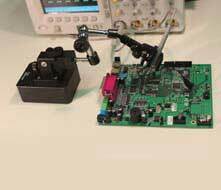 Flex Positioner FP80 is a versatile, low-cost positioner for holding a variety of test probes, especially the widely used oscilloscope probes. 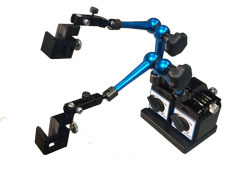 Using the articulated arm for coarse positioning first and then controlling the fine adjustments with the XY stage and Z-axis probe force knob, one can make good test measurements with reliable probe contact. Base Weight: 1.6 kg/3.5 lbs. Base Plate Weight: 1.2 kg/2.6 lbs. 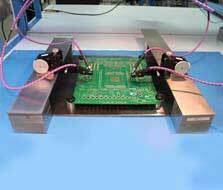 For tight probing area, two FP80’s holding Separate probes can placed side-by-side. 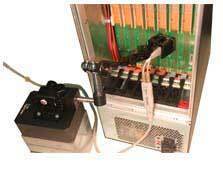 The magnetic switch at the base can be turned on and off for the ease of moving the FP80. An additional steel base plate with anti-static rubber bottom allows FP80 to extend the long flexible arm in full length as it stands on a regular nonmetallic bench.